It would make Sion a household name across the world. The ambitious CHF 1.98billion bid to bring the 2026 Winter Olympics to Switzerland is gathering force and, if successful, could be a wonderful boost for the town’s economy and culture. They would not only be Sion’s games. The bid has been made possible by the International Olympic Committee’s (IOC’s) relaxing of its regulations in its Olympic Agenda 2020, so that tournaments no longer have to be hosted by a single region. In 2006, under the old rules, Sion unsuccessfully bid for the Winter Olympics with a proposal that would have created a full-sized Olympic village in the town and a temporary speed skating rink in Martigny. The proposed 2026 competition would take place across five Swiss cantons, much of it on existing sites, meaning that comparatively little infrastructure would need to be built (unlike, for example, the city with over 100 facilities which was created for Sochi 2014). It would be the first time Switzerland has hosted the games since 1948. 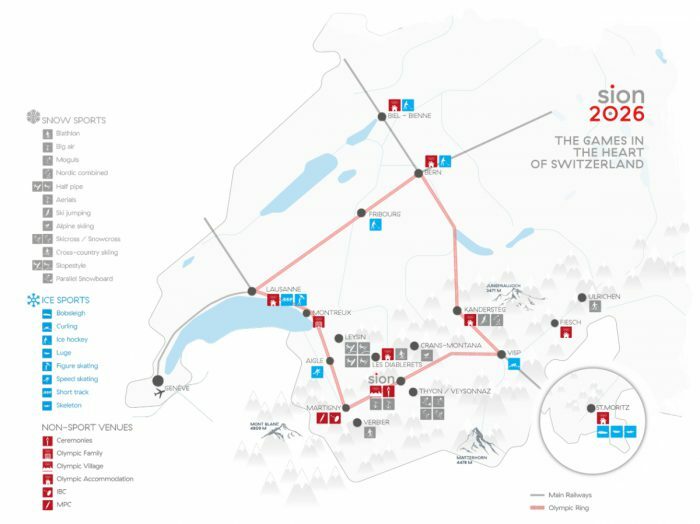 Sion 2026 events would take place from Biel/Bienne to St. Moritz, with ice skating and speed skating in Lausanne; ice hockey in Bern; acrobatic ski jumping in Sion and ceremonies at Stade Tourbillon; alpine skiing and snowboarding in Crans-Montana and bobsleigh in St Moritz (see the map, above). How will it change the town? Accommodation for the athletes and trainers would be spread across the region, near to the venues; 1,400 beds are intended to be provided in Sion. One proposed site for this village is in the Quartier des Potences in the west of the town, on land owned by the commune. It is hoped that this mini Olympic village could be turned into some kind of permanent housing. Does everyone think it’s a good idea? Local political parties the UDC Sion and the Swiss Greens, as well as the WWF in Valais, are opposed to the bid. The UDC claim the idea is being propelled by organisations who have invested business interests, while the WWF argue that it will have to counter climate change in ways that are not environmentally-friendly, and that an event focussed on winter sports will not benefit year-round tourism. Will residents get a say? There is likely to be a referendum on the issue in autumn 2018 for registered voters in the four cantons: Vaud, Valais, Fribourg and Bern. They would not be asked whether the games should go ahead as this is not possible under Swiss direct democracy, but whether a specific amount of public funding should be allocated for them. When will we find out if the games will happen? The Federal Council, Switzerland’s seven heads of state, gave a green light to the proposal in October this year. * If voters also give their approval in the referendum, a formal application will have to be made to the International Olympic Committee in autumn 2018. The IOC will then take a year to pick a host city from the possible contenders, announcing its decision in October 2019 at its 133rd annual session in Milan. *This article was amended on the 18th October to include the decision by the Federal Council. What other cities are in the running? For the moment, possible contenders could include Calgary, Canada; Stockholm, Sweden; and Sapporo, Japan. To find out more, see the Sion 2026 website (in French or German only). It is all just marketing hype. The spin doctors are already at work. Organizing winter games at the time of global warming is nonsense : we should concentrate on 4seasons tourism, on local needs.